Writers are fluid in the big two comic publishers. That is as bankable as the fan outrage that will pour out after popular writers are left in the cold. Gail Simone’s announcement about being fired from DC Comics Batgirl title, on Wednesday December 5th, by email, flabbergasted the comics community. Readers across the Internet found tons of condolences, outrage and concern. One thing hard pressed to find, perhaps it cannot be found at all, were those happy about the announcement. That’s because Simone’s run on Batgirl was successful, bringing the company money, and the most high profiled female character in the DCnU right now. Also, Simone was known in the online community for continually towing the company line. 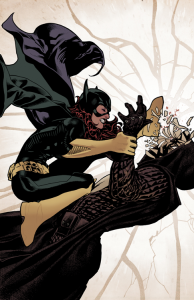 Her “Ape in a Cape” tumblr was always peppered with questions from fans about what was really going on with Stephanie Brown, Barbara being Batgirl again and how it all came about. No matter what, Simone handled the questions tactfully and directly siding with DC and the editor’s decisions. However, many female readers (myself included) are left with even more concerns. You can look at the complaints of, ‘It’s one fewer female writer… it’s not fair… it’s just the editors being part of an old boys club.’ Those complaints are just that: complaints with no pure factual foundation. However, with little to go on uneasy can easily grow. These small pieces looked at individually are not seen as much. 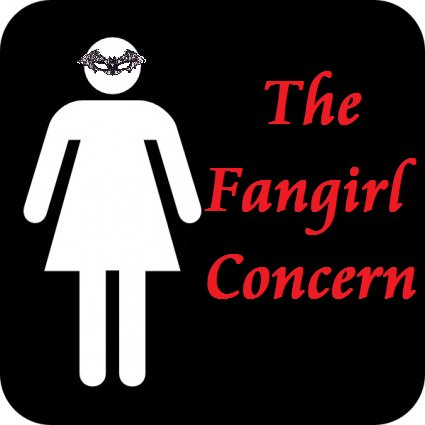 When viewed as a whole they can just leave a fangirl feeling sick. Especially if the fan has tried justifying some of these decisions thinking, “editorial must have some long term plan.” Revelations lately would speak to the contrary. In the end a fangirl has to decide with her wallet if the character is more important than the loss of that same character’s defining writer. Let’s be clear, that is not a call for a boycott. It’s a statement of fact. The only thing that matters in the comics industry is sales. Or it was, until Wednesday December 5th. Gail wrote the most graceful letter on her tumblr in response. Gail wins here. DC loses. Agreed. This whole situation is a rotten deal, but Gail has definitely held her head high through it all. Can’t wait to see what she’s doing next! @Jack: Good point about the Robins…they’ve tried every which way to make a redundant character work there, but when it comes to these recently successful female leads, they give up pretty quick. I, too, was a little disturbed when I heard about Simone’s firing – however, I’m preferring more of a “wait and see” approach. The past year, DC hasn’t done anything (really, anything, that I can think of) without a solid reason, either financial or artistic (and generally some combination of the two). Admittedly, though, I’m almost more disturbed by the way people are reacting – both to this and to Karen Berger stepping down. Especially in the case of Ms. Berger, everyone has zeroed in on the fact that DC/Warner stopped supporting a line that hadn’t been making money for the last 20 years – instead of the fact that for 20 years, they supported a line that didn’t make them any money, but gave the comic-reading community such a staggering amount of true gifts, from 100 Bullets all the way to Y the Last Man. Am I saying that there was a good reason for one of the best writers in comics being fired from one of DC’s best books? No, not necessarily. I have no idea – but then again, neither does anyone else at this point. Only time will tell on that one. What I am saying is that maybe instead of focusing on the last page of Catwoman # 1 (admittedly, a crude and unfortunate piece of work), people should instead be looking at the really interesting narrative that event was only a small part of, and that played out over the next 12 issues. Instead of focusing on how poorly Starfire is being handled (a character who is very dear to me – the Wolfman/Perez Titans were part of what really inspired me to get heavily into comics after a period of flagging interest in my youth), maybe people should be looking at how spectacularly Wonder Woman has been revitalized. For every negative decision DC has made in the past year, I can generally point you to several brilliant moves. It hasn’t been perfect, nor will it likely get there (at least not till they cancel Red Hood in favor of a Spoiler ongoing), but for the moment, DC is still putting out a staggering number of truly excellent books each and every month, and continuing to prove to me, whether it’s through sales initiatives like their return-guarantee backing of the first two issues of Talon, Sword of Sorcery, Phantom Stranger, and Team 7, or just great ideas that pander to my inner fanboy like the surprisingly excellent Batman Beyond Unlimited (still the best of the bat-books), that they still care about their comics, and aren’t just waiting for the next big movie hit like certain other companies I could name. For the record, I read the first 7 issues of Catwoman and loved them. I agree with most of your post michael but your very wrong on virtigo it has made dc very much money and it’s not that dc is not supporting it.It is simply competion virtigo books are mostly creator owned with built in rights for tv/film to warner bro’s.so many creators are just chooseing not to go to virtigo when they have more options then ever kickstarter,image,darkhorse,boom,dynmite ect….virtigo book’s have huge shelve life on there sale’s something like fable’s might sell 50-100k in trade’s a year same for sandman and hellblazer.that is a huge recurring revenue.fable’s sold about 100k in trades for 2011 and y the last man did about 45k and sandman,preacher did about he same and next year they will prolly do the same.